If you take a walk up the trail to Guppy Falls during peak Spring wildflower season, you may notice that on the left side of the trail, looking down into the ravine, woodland wildflowers are quite plentiful. 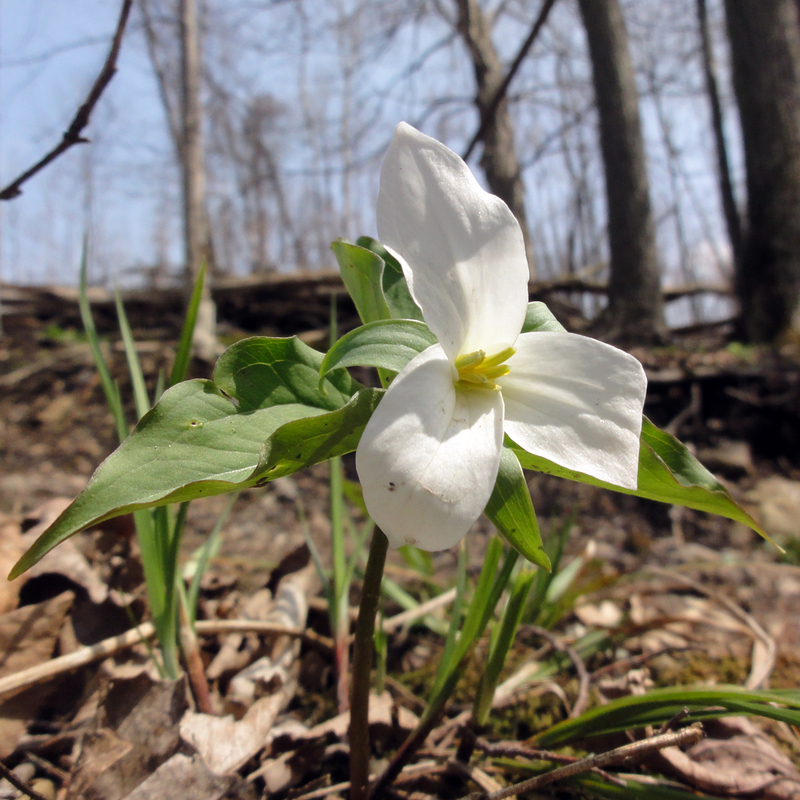 You may see red or white baneberry (doll’s eyes), trout lily, false Solomon’s seal, blue cohosh, and probably lots of trillium, among many other native wildflowers. But when you look over to the right, there are very few of these wildflowers. Is it because the terrain on the left is pretty steep, and the land on the right is somewhat flatter? Indirectly yes. But it’s not that the wildflowers won’t grow on flatter terrain. In fact, there most likely were plenty of those wildflowers on the right side of the trail at one time. A more direct reason why there are so few is that the flatter land has been cultivated. This land was once part of the Guppy family farm, and for about thirty years during the mid-to-late 1800s, with the exception of the land that was too steep to plow, they farmed most of the land. The trees were removed and the wildflowers were plowed under for a long-enough period that none of their viable genetic material remained in the soil. Others came after them and continued to cultivate parts of it until at least the 1930’s. Since the agricultural use of the property was halted, trees have returned, some through reforestation, and many through natural seeding from nearby areas. Native shrubs and herbaceous plants (including a few wildflowers like Jack-in-the-pulpit) have also returned to the right side of the trail. A lot of exotic (some invasive) plants and shrubs have also moved in. But many of the native wildflowers have barely spread at all from the left to the right side of the trail. The reason why the wildflowers have not returned is the subject of research being done by Greg McGee, a SUNY-ESF professor and Skaneateles resident, who has worked with his students studying the phenomenon at the Guppy Farm. Greg, along with Emily Van Ness, a graduate student at SUNY-ESF and Envionmental Educator at Baltimore Woods, have now set up a citizen-science wildflower-restoration program, working with volunteers from the Skaneateles Garden club, Baltimore Woods, and others to determine how best to reverse the loss of wildflowers from post-agricultural woodlands. One of their test sites is near Guppy Falls. They have also set up similar sites at Baltimore Woods and Camillus Unique Area. If you would like to get involved with the citizen-science Wildflower Restoration Project, please visit their website at http://www.esf.edu/restorewildflowers/. And if you need a place to set up a test restoration site, the Skaneateles Conservations Areas have plenty of post-agricultural lands that need your help. However, please don’t plant anything at the Conservation Areas without permission.